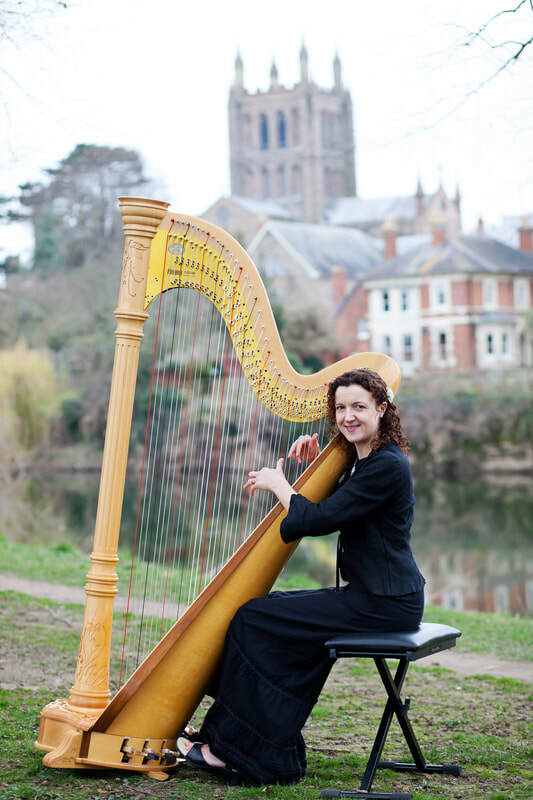 Charlotte is a local harpist, who began learning the harp at the age of 10, and the following year was awarded a major music scholarship to Badminton School, Bristol. By the time she commenced the BMus course at Goldsmiths College, she had gained Grade 8 on the harp, flute, piano and saxophone. She also regularly competed in and won many Music Festivals and Eisteddfods in both Wales and England. During her studies for her Postgraduate Diploma in Performance under Valerie Aldrich-Smith at the Royal Welsh College of Music and Drama, she was awarded a 3 month exchange scholarship at Turin Conservatoire under the guidance of Gabriella Bosio. Since finishing her Diploma she has been teaching in both Gwent and Hereford and regularly performs as a soloist as well as with numerous orchestras, which have included the Tenerife Symphony Orchestra and in the Last Night of the Proms. Charlotte has also brought out 2 solo harp albums called ‘Strings Over Time’ and ‘Strings of Change’ as well as a harp and voice album called ‘There is My Love’ with Marianne Lihannah.